Hello ladies!! This will be a short one, but I needed to drop off some goodies! if you want any changes let me know!!! And for the rest of you lovely girls...I made a new wallpaper...enjoy! Looks like I missed a couple of birthdays soooo...Raine and Lulu HAPPY BIRTHDAY!!! Hi everyone, I only have a sec, but wanted to say Hi to everyone. I am going away for the weekend and away from a comuter so I hope to go back on a little later. Raine- I am glad you are safe. Ilovetwilight0509 wrote: Especially since he was hugging right under my breast. Happy Birthday Lulu! Hope you have a great day! My heart is for Japan right now. The last report I saw estimated the death toll at 1,000 They have delayed shooting for BD even because it's affecting shooting. The west coast is also being warned. 4 people died on California's coast because they were shooting pics of the waves and got swept away. I hope you stay safe Raine! (I have another friend that lives there as well) I will be thinking about you all day and pray things are okay. EDIT#2: I am watching ABC news right now and all I can do is cry. The images they are showing of the devastation is horrendously heartbreaking. How coul anybody not feel sadness and grief when confronted with these images before our eyes? The thing is, not just Japan has been affected. Hawaii has been affected and so has the entire west coast. Just imagine how many people have lost their lives How are the west coast HH sisters doing? Let us know how you all are doing! Raine, how's it going for you? Brienna~ I hope your son heals quickly from his surgery. Raine~ You were in my thoughts today as I watched the news. I was hoping there'd be a post from you letting us you were okay. Stay safe. Marielle~ That's really unfortunate about your mom's car. At least it looks like she'll get to keep it. I avoid buying clothes online because I'm always nervous they won't fit. I like to try things on first to make sure they fit and are flattering. Sometimes what looks good on the hanger doesn't necessarily look good on your body. lulu~ Is it your birthday today? It's not listed on forum homepage. Oh well. Happy Birthday!!! Many happy returns!!! Ann-Marie~ That would be so exciting if you're able to go to the WfE London premiere, particularly if you get to meet up with some HH sisters. Keeping my fingers crossed for you! HAPPY FRIDAY, GIRLIES!!! It's the end of a very long week, and I'm sitting in my pj's with a white wine spritzer at my side. Life is blessed! My heart goes out to the people in Japan who have lost loved ones, homes, and possessions. Right about now, I am a very happy person that I didn't buy Twi-Con tickets for Nashville because most of the scheduled people have had to cancel due to the weather. Anyhoo...I have a good friend who has just called and we are discussing our upcoming trip to Hot Springs, Arkansas during Spring break. I'll be back tomorrow sometime. Night Night! Hi laddies, I will away for a couple of days and then it is my daughter's birthday so I will be MIA for a little. I hope you ladies have a great weekend and feel free to post as many pics as you like. I love catching up on the pics. lol Have a great weekend. I can't believe we have to “spring forward” this weekend for the time change. I hate losing that hour of sleep, although I look forward to the extra hour of daylight in the afternoons. I know most of you in the U.S. have daylight savings time (except Caryn, I think?) but do those of you from other countries have any sort of time change in the spring and fall? this gem! Boy, that one really woke me up this morning, and I thought it couldn't hurt to post it again. I hope your back is feeling better after your massage. Hubs and the kids gave me a gift card to a local spa for Valentines, and I fully intend on redeeming it for a massage or two in upcoming weeks. Hope your Mom is able to get everything straightened out with her car. What a pain, although I'm sure it will make for a great story, once everything is all squared away. Glad you had good luck with your on-line shopping spree. There is something so nice about being able to shop in front of the computer, while wearing your PJ's. I absolutely agree about Catherine Hardwicke.....she needs to quit riding on Rob and Kristen's coattails and just shut up about them, already. Jaclyn~ It sounds like you've certainly had crazy weather there, with the snow, sleet, wind, and rain. I guess Mother Nature can't quite make up her mind. We look forward to seeing more of your ActionRob pictures. Is Inn Bru a type of beer? I'm sure ActionRob would be very pleased with it, as our Rob seems to be quite fond of beer, himself. And I can't say that I blame him. So you love Italian food—without cheese? I didn't know they made Italian food without cheese. My daughter had her 2nd basketball practice last night, and is enjoying herself very much. Their coach is actually an assistant coach for one of the local high school girls' teams.. She's probably about twenty-five years old, and is very nice with a great attitude, but she'll also hold the girls accountable for paying attention and practicing hard. I think it's neat for these 11 and 12-year-old girls to have a positive female role model like her. Caryn~ You've had quite the weather changes too. I think everyone around here just wishes spring would get here already. You certainly traveled a lot this week! Hopefully you get to rest and recuperate a bit at home over the weekend (although I'm sure at least one of your boys has a soccer tournament somewhere). Yay for Butler...didn't they win their conference tournament and should be headed to the Big Dance? I just watched Vanderbilt beat Mississippi State in the quarterfinals of the SEC tourney! Vandy will play Florida tomorrow in the semi-finals and it should be a tough game. Florida has already beaten us twice this year and they're looking really great. But you never know....maybe the third time will be the charm. Hope you enjoyed your nap today. I never take a nap on Thursdays (my usual day off work) because I enjoy having a little time to myself to run errands and relax while the kids are at school. But I was so tired this past Thursday, I fell asleep in our bed wearing blue jeans, a fleece pullover, and even my earrings. I loved that you wrapped Jaclyn's Vanity Fair in bubble wrap....way to protect the goods, girl. Ann Marie~ Great to hear from you again. Hope things are going well for you and you're enjoying your guitar lessons. Dawn~ Have a great trip this weekend and be safe. Jenn Jenn~ Congrats on reaching the milestone of 1000 posts, and finally “catching sight of Edward”. I think I'm about 40 posts behind you. Raine~ I'm glad to hear you had a nice birthday and enjoyed some pampering from your family and your coworkers. I'm sorry to hear you're still sick, and hope you feel better soon. Are you close to finishing WFE? We're relieved to hear you and your family are alright, with the tsunami. Please stay safe. We'll certainly keep the country of Japan, and all those affected by the terrible and tragic earthquake and tsunami in our thoughts and prayers. Lulu~ Happy Birthday! We'd love to see some pictures of your hair, and the highlights sound gorgeous. I'm sure your husband loves it, and that's sweet that he was excited about you making some changes with your hair. Susie~ I'm glad to hear your observation from your lead teacher went very well—not that I had any doubts, of course. You're sweet to teach your Mom to use the internet. Sometimes I think my Mom uses the internet even more than I do, although she doesn't use Facebook or any of those types of websites. Congrats again to Sonny Boy for the music scholarship, and especially for receiving $13,000 in scholarships, so far! That's wonderful, and I'm sure you and your hubs are extremely proud of him. I'm glad to hear your daughter is having a good time in Mexico. I'd love to have a link to her blog too; it would be very interesting to read. Christina~ I'm sure you're relieved to have made it through this busy week at work, and happy the receptionist will be returning next week. I think yours and Marielle's speculation about the presence of the cigarette in some of the WFE trailers was correct. Most trailers seem to be rated “for all ages”, even when the movie is rated PG-13. In one of the Deathly Hallows trailers, I remember they removed the blood on Hermione's hands in the scene just after Ron was splinched, and you can clearly see the blood on her hands during that particular scene in the movie. Maybe Marlena's cigarette will still show up during the movie? Have you found a copy of Vanity Fair yet? I finally found the new issue Wednesday night at Barnes and Noble, and walked out of the store carrying my two copies, with the silliest, dorkiest grin on my face. I'd also be glad to send you a copy if you still haven't found it, and if Caryn has sent her extra copy to someone else. Missp~ Are you completely worn out after your long week? I'm sorry you had school until 7 pm Thursday night. Hope you get to rest and recover this weekend. I'm sorry it didn't work out about the Twi-convention here, but I guess it's for the best. I remember posting a couple of weeks ago about Jackson Rathbone not being able to come, and that's too bad that other cast members weren't able to make it either. I'd still love to see WFE together sometime, if you make the trip up this way. Fi~ Good luck with signing the contract for your new place on Saturday, and I hope you and GB are able to get in a few days early to unpack properly and get settled. Your musings on having your own home and needing your own space made perfect sense....I think it's very healthy for both members of a couple to have some time (and space) to themselves. Good luck with your web design course. 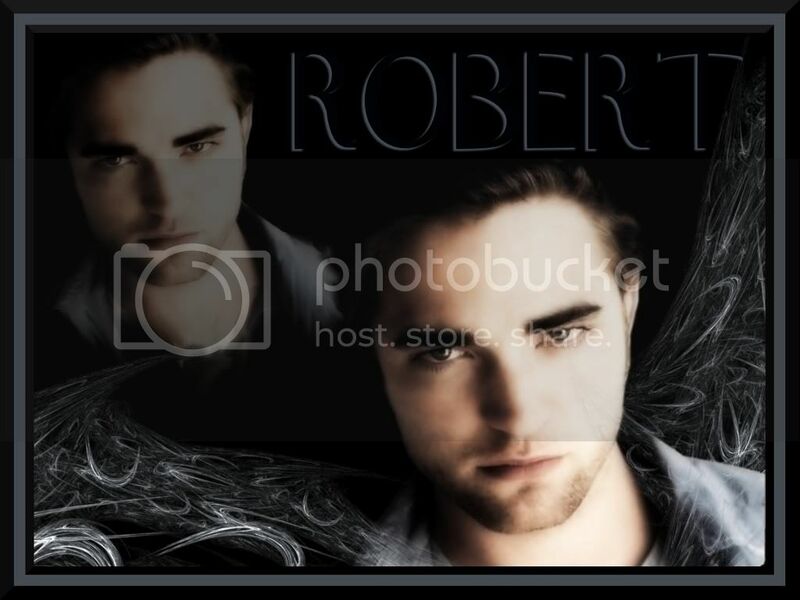 Tammy~ What lovely banners and wallpaper, as always! Hope things are well with you. Brienna~ How are you feeling? I'm so sorry about your son's tooth, but hope he'll be out of pain now. Good luck with your little girl sleeping through the night.....this too shall pass.